killed them. 7The king was enraged. He sent his army and destroyed those murderers and burned their city. 8“Then he said to his servants, ‘The wedding banquet is ready, but those I invited did not deserve to come. 10So the servants went out into the streets and gathered all the people they could find, the bad as well as the good, and the wedding hall was filled with guests. 11“But when the king came in to see the guests, he noticed a man there who was not wearing wedding clothes. 12He asked, ‘How did you get in here without wedding clothes, friend?’ The man was speechless. “I will bring you to Zion. my sacred hill, give you joy in my house of prayers, and accepts the sacrifices you offer at my altar. My Temple will be called a house of prayer for the people of all nations.“(TEV). Based on Isaiah 62:5, it has to be noted that God and the groom are two distinctly different entities, which distinction is implied in the statements “He who formed you will marry you. As a groom is delighted with his bride. So your God will delight in you.” Impliedly, therefore, the present false doctrine that “Jesus Christ”, who is believed by some biblical scholars as the groom, and God are one and the same entity would not stand scrutiny using the verse in Isaiah 62:5. The ‘Jesus is God’ doctrine that is being proliferated by Christians is thus false. Now, how is this parabolic invitation being referred in other verses of the new testament? This is found in Matthew 24:14, which refers to the Good News. It states: “And this Good news about the Kingdom will be preached through all the world for a witness to all people; and then, the end will come“. The ‘end’ refers also to the parabolic readied banquet (“x x x. Tell those who have been invited that I have prepared my dinner: My oxen and fattened cattle have been butchered, and everything is ready. 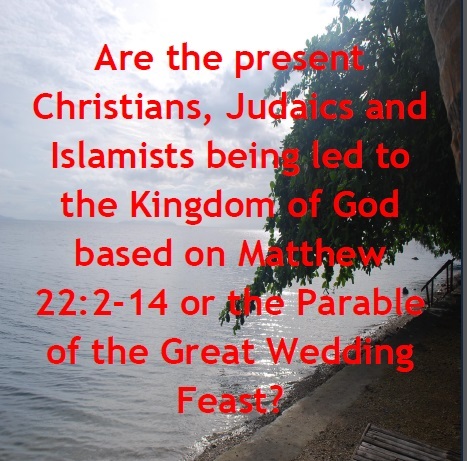 Come to the wedding banquet“(Matthew 22:4)). Also, the Good News is not only limited to the new testament but likewise includes the old testament as the former is merely the continuation of the latter, and as the true Christ himself declared that: “17Do not think that I have come to abolish the Law or the Prophets; I have not come to abolish them but to fulfill them. 18For truly I tell you, until heaven and earth disappear, not the smallest letter, not the least stroke of a pen, will by any means disappear from the Law until everything is accomplished.” (New International Version (NIV)). In the parable, the servants of the King are the apostles and the followers. Also, according to Isaiah 66:7, the Zion, as the sacred hill, has to be considered vital to the venue of the wedding feast as it is being intended as a place of prayers for all nations. Other Christian churches and movements. All of the above Christian churches and movements are claiming that salvation is in their favor. However, if you base your logic on the above parable, their belief that they are saved is deemed FALSE. It is because the parable is referring to those who were originally invited as the invitees who refuse to come in the wedding feast. Notably, the Christians are obviously the original invitees more than that of Judaisms and Islamists. It is because the invitation for Christians is complete-that is-it contains the new testament in addition to the old testament, although it is contaminated with fictitious name Jesus. What is then the relevance of the name Jesus to the parable? Its relevance is that it being a fictitious name, the same will cause the believer to be violent or to mistreat the proponent, if another name is presented as the true Christ. Also, they are less likely to believe on the original Hebrew name of Christ, despite the fact that Jesus is the son of perdition, hence, the parabolic verses in Matthew 22:5-6 stating that “5But they paid no attention and went off—one to his field, another to his business. 6The rest seized his servants, mistreated them and killed them”. In short, since these Christian churches, including Judaism and Islam are the originally invited guests by the King, it becomes conclusive that they are misguiding their followers not to attend the wedding feast. Because of their refusal, the guests that are being entertained in the parable are instead coming from the streets. Who is this man in Matthew 22:11-13? Obviously, this man in the parable is Jesus Christ. It is because in the first place, the name Jesus never existed in Bethlehem at the time when the true Christ, who has an existing Hebrew name that is being pronounced as ‘Yahushua’, was born until he was crucified. Based on history of the English bibles, the name Jesus was merely transliterated to English from a Greek name Ἰησοῦς (Iēsous). Also, linguists allege that the Aramaic name ‘Yeshua’, the alleged origin of Greek name Ἰησοῦς (Iēsous), if directly transliterated to English or without passing through the Greek language will result to Joshua, not Jesus. How much more for a Hebrew name, which is being pronounced as ‘Yahushua’? Finally, therefore, since the Hebrew name of Christ would not result to Jesus if directly transliterated to English, it becomes conclusive then that Jesus is a false and fictitious name of Christ and its origin is, in fact, Greek. It consequently follows that Jesus Christ is a false Christ. Naturally, the remedy of the King is to task his servants to parabolically ‘Bind his hands and feet and throw him into the outer darkness, where there will be weeping and gnashing of teeth’ (Matthew 22:13), which may not be natural if the man is not fictitious, or is parabolically wearing the proper clothing for the wedding feast. Also, the implication of the verse “14 For many are called, but few are chosen.” in Matthew 22:14 is that all Christians are not assured of salvation through Jesus Christ, without discarding the name Jesus in their belief system, which is less possible under the present set-up. Being false and fictitious name, rejecting Jesus Christ in the belief system of an individual is therefore a fulfillment of a prophetic event that is being described in the parable. By aaphil in The Word on May 9, 2015 .